There is a life list which lists all your goals, but what about a board that lists all of your passions in life. Thankfully my wonderful friends,@gotpassport and @GuyNGirlTravels created one and kept the trend alive. What you are supposed to do is create a collage of what you are most passionate about. It can be cute and quirky, or serious as can be. Whatever it may be, just make sure it lists what you LOVE. With that said, I created one. Granted, it was easy to put down traveling, but as time wore on I tried to think what else I was passionate about, and what I would put down in this collage. It really made me think, and inspired me to live out my goals, and be happy just by simply doing what I love. Do this, it is fun, and you won’t regret it! It really puts things in perspective. Apart from the obvious family, friends and my dog Cosmo which are first and foremost in my life. I will explain to you what I have put down on my board. Deaf/Sign language picture- I am Deaf, and I put down a picture of the word I love you in sign language. Sign Language is a beautiful language, and the history behind it is fascinating. I can go on and on about my deaf culture, but what I am passionate about is trying to make traveling easier for Deaf people. I want to share the world what it is like to be Deaf, and the struggles that comes with it. England- an Anglophile is someone that is addicted to all things English. I am one of them. When I visited the country in 2008, I just fell in love with it. It was so beautiful; the cities were romantic and fun all the same. From London to Canterbury, I loved their charm, big town to small town in the country side. Sitting on the train going from one English city to the next was something I absolutely adored. One day, I hope to move there but until then, I cannot wait to plan my next trip back. Bee- This one is pretty obvious, I put the picture of a BEE to showcase my blog, and it is something I am passionate about. Writing tips and advice for other Deaf travelers. I remember taking a picture of a bee which is posted on the top page of my blog and thinking of the name Travelbee, and along with it my blog began. That was the turning point in my life, and ignited my passion for traveling all over again. Luggage/Passport/Globe/Photography picture- Traveling! No brainier when it comes to this gal. Anyone who knows me knows that I am obsessed with traveling. Notably absent from this list is the People to People Program, going on that program made me realize how much I loved traveling. Yes, I have always loved traveling but I never knew just how much until this trip. I will never know who nominated me to go on that trip, but as I see now it was fate. Cheesy I know, but it simply cannot be a coincidence. To get a letter in the mail saying I was nominated for the program, it just can’t be a coincidence. As for the Globe, I hope to do a Round the World sort of trip, China, Thailand, Australia, and so on all on one big trip. Photography is easy, traveling and photography goes hand in hand. I love it, to be able to capture a picture, and go back home and show your friends. THIS is what I saw on my journey, you are able to capture a picture, but at the same time a memory. A memory captured in a photo can take you back on a rainy day sitting by the photo album; you are suddenly transported back to a whirlwind trip, feeling, seeing, and even the smells of the place. Elizabethtown movie poster/Film reel- I love film, I used to want to be actress, then it was to be a director, then it was to being a screenwriter but that all changed. However my love for movies hasn’t. On lazy Sundays I rent a film or two, pop in some popcorn (kettle corn of course)and I’m good. Indie films, Action films, Comedy, Foreign films, anything is good by me. Which brings me to the next one; it’s an indie film that really left a mark in my life. “Elizabethtown”, I love this movie so much it is actually one of my all time favorites apart from “Singing in the Rain”, and “The Usual Suspects”(and many more). Why is this movie important? well, for a lot of reasons, it is cute, quirky, set in a small town and of course the hero is going through some life changes.The movie is moving, as the hero comes to terms with things and gets the girl in the end after an epic soul searching road trip. Yes, I want to take a soul searching road trip across the united states one day, just driving on the open road. Another thing a quote from the movie really stuck with me. It goes like this “You wanna be really great? Then have the courage to fail big and stick around. Make them wonder why you’re still smiling”. Yes. This movie is awesome, and not to be missed. 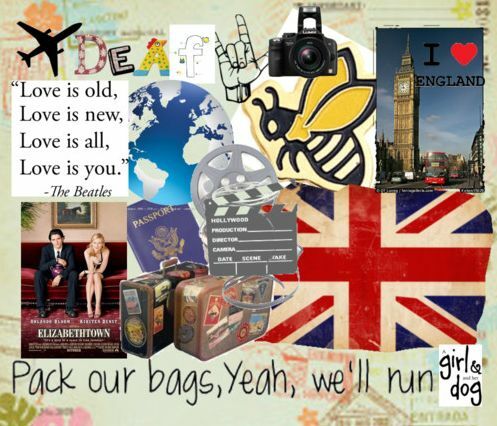 The Beatles song quote- Since I have a Hearing aid that supports my hearing, I am fortunate enough to be able to hear songs. I consider that incredibly lucky. to be able to feel and hear a beat at the same time to me is just great. I often find that people take their hearing for granted, they hear a song and it’s like eh.. But for me, I find it amazing, it is moving, and something I find myself so blessed to be able to hear. I love the classics, and it makes me sad when the greats like Bing Crosby, Dorothy Lamour, Ella Fitzgerald, The Beatles, The Doors, and so on are not appreciated. So, turn on that Ipod, and listen to your favorite song. It can make me happy any day, and brighten up any morning. Especially “Here Comes the Sun” by the Beatles. For references do check out other #passionboards posted by others. Looking forward to seeing your #passionboard! Who says you can’t rot your brain abroad? I love your passion board!!! It was done beautifully. May I ask where you found the ASL picture of “I love you”? Thanks for inspiration. I went to polyvore.com and it’s like a collage website. Just type in Sign Language and you will find the “I Love You” sign there. I love this blog! I found you through Twitter and became a follower and now I am a fan. How about we trade links? I have a travel blog at http://travelers-life.com. Would love to be in your blogroll and have you in mine!